Software requirements reuse becomes a fundamental activity for those IT organizations that conduct requirements engineering processes in similar settings. One strategy to implement this reuse is by exploiting a catalogue of software requirement patterns (SRPs). In this tutorial, we provide an introduction to the concept of SRP, summarise several existing approaches, and reflect on the consequences on several requirements engineering processes and activities. We take one of these approaches, the PABRE framework, as exemplar for the tutorial and analyse in more depth the catalogue of SRP that is proposed. We apply the concepts given on a practical exercise. Franch, X. Software requirement patterns. A: International Conference on Software Engineering. 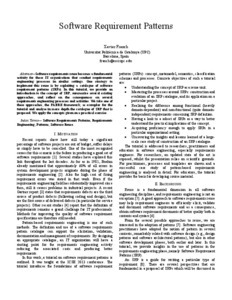 "Proceedings of the 35th International Conference on Software Engineering, ICSE 2013: May 18–26, 2013, San Francisco, CA, USA". San Francisco, California: Institute of Electrical and Electronics Engineers (IEEE), 2013, p. 1499-1501.